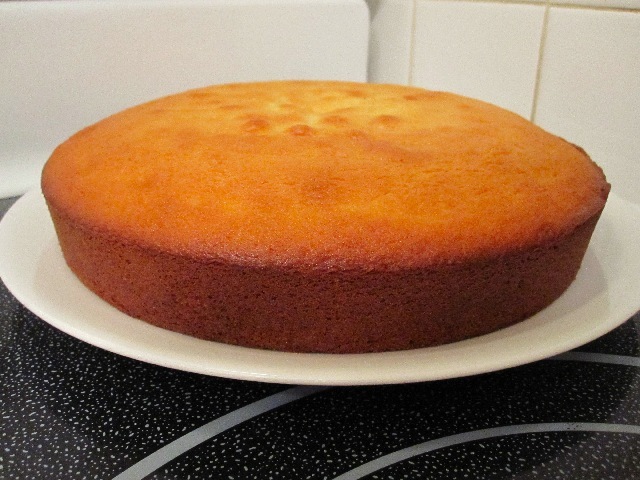 I guess I've been in somewhat of a “plain jane” mood recently, I haven't been baking anything too “exciting.” But sometimes simple is best and with this yellow cake that's exactly what I was looking for. This particular Saturday my mother went insane (well, more insane) and began cleaning out the recipe boxes she has kept since she was a kid. I couldn't resist helping her and perhaps grabbing a few recipes for myself. Nothing is better than old school recipes, they aren't bogged down with reducing fats and sugars (some of the sugar amounts in these recipes are astronomical :)). Needless to say I walked away with quite a few future endeavours. But we spent so much time going through them all that if I actually wanted to bake something it was going to have to be simple and quick. Good thing that's what I felt like. After some discussion with my mother I decided on a nice, unfrosted, yellow cake. This cake was actually the runner up for my mother's birthday cake this year. My mother loves yellow cake, but for her birthday I wanted to bake her something a little fancier. As I looked over the recipe I contemplated reducing the sugar, but for once I was having reservations. When someone says that “Everyone needs a killer yellow cake recipe. This is mine, and dare I say, it should be yours too” it's probably something to be taken seriously. So I went with my gut and didn't change a thing other than halving the recipe and adding a bit of almond extract. After eating a few pieces I can say this is pretty much the best yellow cake I think I've had. And if cupcakes are your thing it would probably make some awesome ones. 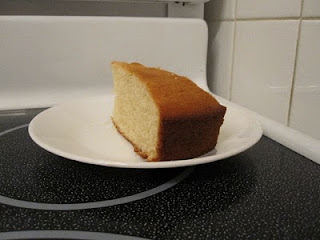 This is now my goto yellow cake recipe, and it should be yours as well :). It's just that good. 'nuff said. In a medium bowl sift together flour, baking powder, baking soda and salt. In the bowl of a mixer add butter and sugar beat until smooth and creamy. Add vanilla and almond extract and beat to mix. Add the eggs one at a time until completely combined. Reduce mixer speed to low and add milk, beat until just combined (the original recipe comments that it will look “curdled” I say it looks more like cottage cheese :)). In three additions slowly add dry ingredients to wet, scraping down the bowl as necessary, mixing until just combined. Pour batter into prepared pan and tap it gently on the counter to remove any air bubbles. Place on centre rack in oven for 35 – 40 minutes or until toothpick comes out clean and cake is golden brown (this took 35 minutes for me). Remove cake from oven and allow to cool in pan on rack for 10 minutes. Remove from pan and allow to cool completely on rack. Ice with your favourite icing or dust with powdered sugar. Alternatively, enjoy it as I did, “au naturel." First of all, the cake was delicious, even though at the time I was not in the mood for yellow cake due to bad experiences with it in the past. Secondly, why do people use chocolate frosting with yellow cake? I think it would work better with a vanilla frosting. Lastly, I like the Lord of the Flies reference. Even though it's not my favorite book, I used to quote that one part quite a bit in high school. I'm glad you enjoyed it :) and that it managed to over shadow a previously bad experience :). Chocolate frosting I think most people use it because it's a contrast in flavour. Yellow cakes have a tendency to be sweet in a way that a chocolate frosting is not. A vanilla frosting would have a similar sweetness, not that there's anything wrong with that, but sometimes it can be overwhelming. However, this is not at all the reason I want to try a chocolate frosting, it has more to do with my preference for chocolate :). Oddly enough, I can't stand Lord of the Flies :).